You can search for connected objects here. If you do not want to see all of the categories in the list, simply deselect the corresponding checkbox - e.g. to only view applications. Activate the corresponding checkbox if the linked object should be included in the export package. Displays the title of the linked object. Displays the object that references the current object. The keyboard combination CTRL + SHIFT + A selects all of the entries in the list. The keyboard combination CTRL + SHIFT + D deselects all of the entries. 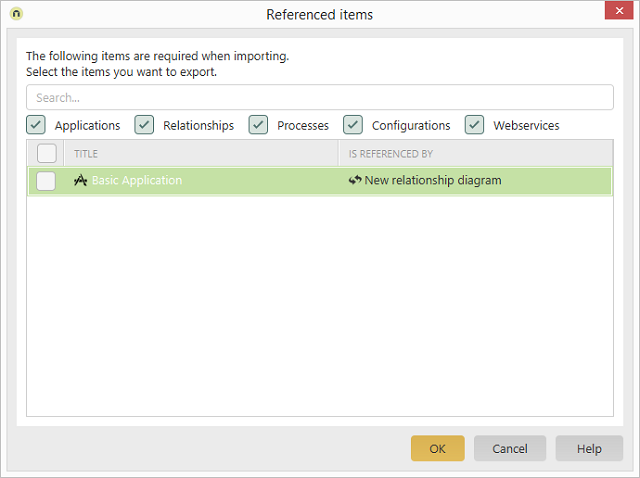 All of the objects selected here will be added to the export on the export overview page when you click on "OK".